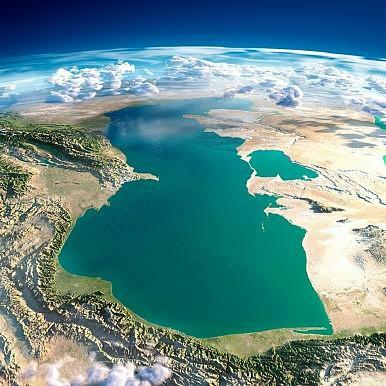 The Caspian Sea is the largest closed water body in the world and is surrounded by five states--Azerbaijan, Iran, Kazakhstan, Russia and Turkmenistan. 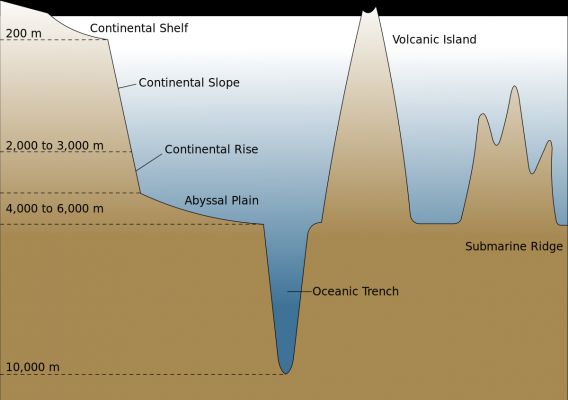 It has an area of 440,000 square kilometers with an ultra-depth of 1,025 meters, a length of 1,440 kilometers from north to south and width of 320 kilometers from east to west. Due to fluctuations in the water level, which over the past century has oscillated significantly, those figures are not constant. The mineral resources of the Caspian Sea attract the most attention, and not only from the littoral states. U.S. Energy Department experts estimate that the Caspian region's oil reserves comprise 200 billion barrels (about 16 percent of the world reserves). While some emphasize the big potential of the Caspian oil resources, others refer to more modest figures. Those observers who are skeptical about the volume of Caspian oil say that it will, at most, reach 5 percent of the world demand. Geopolitical and economic interests stand behind the disputes surrounding the significance of the Caspian oil resources. Some circles do not want to see Western oil companies in the Caspian region. Others, such as traditional oil producing and exporting countries, may be less than happy about the emergence of new competitors. The country most interested in diminishing the quantity of the Caspian oil is Armenia. As is well known, a significant portion of the Caspian oil reserves belongs to Azerbaijan, against whom Armenia has territorial claims--namely, Nagorno-Karabakh region of Azerbaijan. This territory and six other Azerbaijani regions are occupied by Armenia. Although a ceasefire has been held for seven years, the conflict has still not been resolved. Logically, pro-Armenian circles worldwide, foreseeing the possibility that, as a result of multi-million investments from the West, the geopolitical situation in the region may shift in favor of Azerbaijan, are interested in distracting the attention of the Western world from the Caspian oil deposits. Neither should the navigational value of the Caspian Sea should be underestimated. 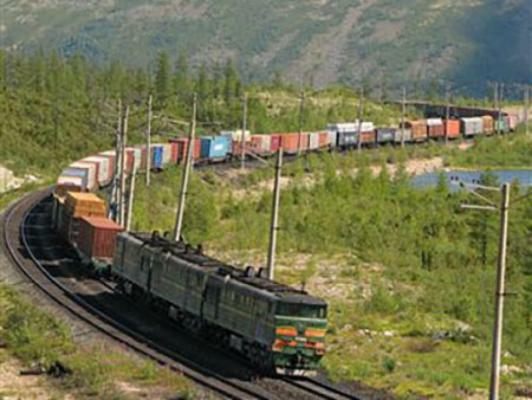 The Caspian Sea is connected to the Black, White and Baltic Seas via the Volga-Dnepr-Don rivers channels. 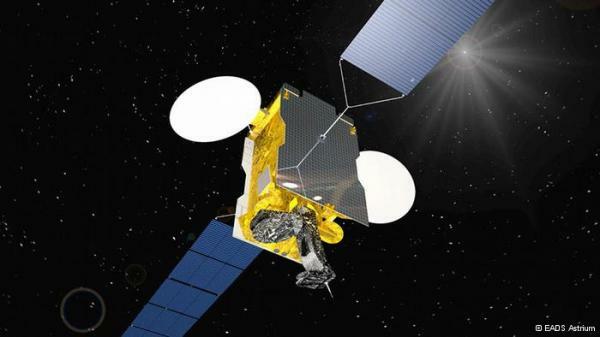 Moreover, the TRASECA project, which will create a Eurasian communication route through the Caspian region, means that it is impossible to overestimate the significance of the Caspian Sea's geographic position. 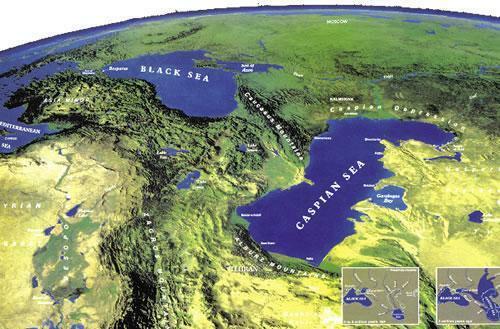 Although historically called a sea, the majority of geologists classify the Caspian Sea as a lake. But legal experts are inclined to classify it as a closed sea. What difference does it make, and for whom? The issue is neither a purely legal or geological. Since the collapse of the Soviet Union, the Caspian Sea, which was previously shared by the Soviet Union and Iran under bilateral treaties of 1921 and 1940 , has had to be shared by the five littoral states: Azerbaijan, Iran, Kazakhstan, Russia and Turkmenistan. These have not been able to reach on how to divide the sea and its resources. 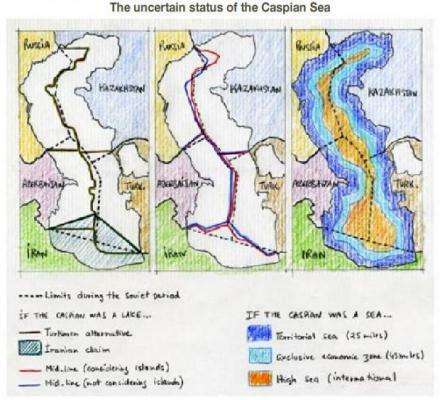 Classifying the Caspian Sea as a sea or lake can have an impact on the principles of its delimitation among them. Should the Caspian Sea be classified as a sea, the provisions of the United Nations Convention on the Law of the Sea of 1982 (UNCLOS) will be applicable. According to the relevant UNCLOS provisions, each littoral state would have a territorial sea with the breadth not exceeding twelve miles, an exclusive economic zone not exceeding 200 miles and a continental shelf. Bearing in mind, however, that the maximum width of the Caspian Sea does not exceed 200 miles, Article 15 of UNCLOS mandates that the territorial sea of States with opposite or adjacent coasts must not extend "beyond the median line every point of which is equidistant from the nearest points on the baselines from which the breadth of the territorial seas of each of the [two] States is measured." 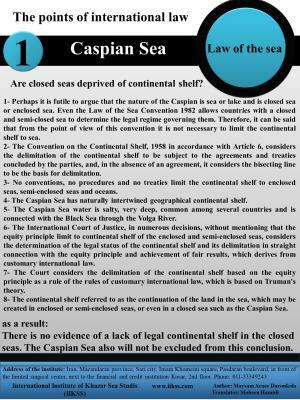 Should the sea be classified as a lake, in the absence of an international convention on the subject, international customs as evidence of a general practice accepted as law will be the primary source for establishing the Caspian Sea's legal regime. The practice of delimiting lakes between/among littoral states overwhelmingly shows that lakes are divided so that each costal state has an exclusive sovereignty over the biological and natural resources, water surface and shipping in the national sectors, which are formed by outlining a median line and the external border of the respective sectors. For example, these principles were generally applied in the division of the Great Lakes between the United States and Canada, Lake Chad among Cameroon, Chad, Niger and Nigeria, Lake Malawi among Malawi, Mozambique and Tanzania, and Lake Geneva between Switzerland and France. There are examples of joint ownership of lakes by littoral states. For example, Lake Titicaca is jointly owned by Bolivia and Peru. This approach, however, is more the exception than the rule. The headline of an article in the New York Times--"It's a Sea! It's a Lake. No. It's a Pool of Oil--reveals one of the major issues behind the fuss over the Caspian Sea's legal regime. "A weird linguistic quarrel has big-money consequences." Indeed, if determining the legal regime of the Caspian Sea did not have implications for profits that might be gained from the Caspian resources, the problem would already have been resolved. Because of the complex of interests involved--among them political, geopolitical, economic and geological--the littoral states have different views on the principles to be applied to the delimitation of the Caspian Sea. Without considering such interests, it is impossible to understand the states' stands regarding the Caspian Sea's legal regime. Who will be entitled to what portion of the Caspian Sea is important to both the littoral states and others. The Caspian natural resources provide and opportunity to the newly independent states--including Azerbaijan, Kazakhstan and Turkmenistan--to boost their economies and thereby strengthen their political independence. At the outset of the dispute, Iran and Russia (which, following the collapse of the Soviet Union, became its successor state with respect to international treaties, among other things) insisted on applying the provisions of the bilateral treaties of 1921 and 1940 on all five littoral states in connection with the delimitation and use of the Caspian Sea. In particular, they both believed that, in light of provisions of the 1921 and 1940 treaties, the Caspian Sea should be under joint ownership and exploited on a condominium basis. Azerbaijan and Kazakhstan oppose this approach are Azerbaijan--as did Turkmenistan initially, before it changed its position. To support their opposition to the Iran-Russia stance, they argue that the treaties of 1921 and 1940 defined the Caspian Sea as the Soviet-Iranian Sea and established a border along the Astara-Gasan-Kuli line, which de facto divided the Caspian Sea in two national sectors. Thus, in the view of Azerbaijan and Kazakhstan, the 1921 and 1940 treaties do not contain any provisions that support the joint ownership and condominium arrangement. 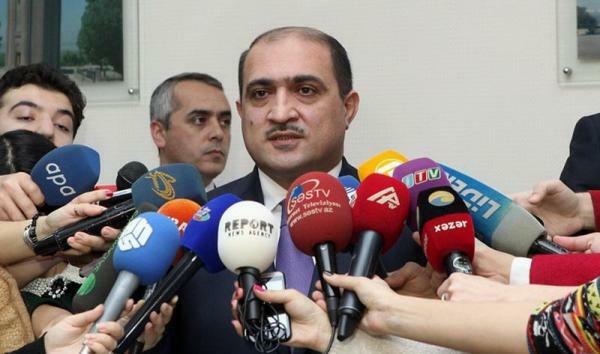 Azerbaijan and Kazakhstan would like to establish a new legal regime for the Caspian Sea. 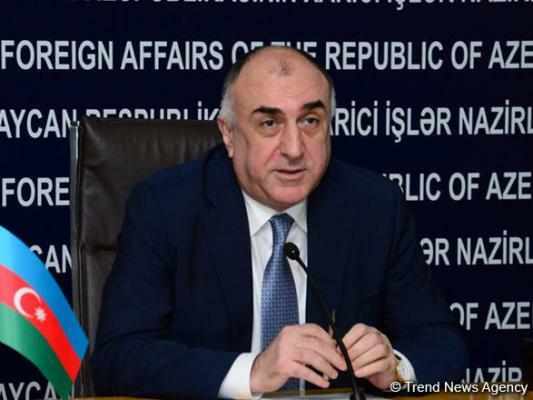 Azerbaijan backs the complete delimitation of both seabed and surface while Kazakhstan leans toward dividing the seabed and jointly sharing the surface. Turkmenistan does not seem to hold any firm position. For the past decade, the views of all littoral states concerning the legal regime and delimitation of the sea have been changing to some extent. Some of these states have reconsidered their initial positions out a desire for compromise and because of changes in geopolitical interests in the region. But while the gaps between the littoral states have narrowed, there is still no consensus. The following overview attempts to show the evolution of their positions in the 1990s. Russia further stated that prior to the conclusion of a new agreement between all the littoral states on a legal regime for the Caspian Sea, the former Soviet republics would be bound by the provisions of the 1921 and 1940 Soviet-Iranian treaties. Those treaties provide for free navigation in the Caspian Sea by vessels flying the flag of a coastal state and unimpeded fishing in its waters, with the exception of the ten-mile coastal zone, in which fishing is reserved for vessels of the corresponding State. Since 1994, the Russian position has changed. During a meeting of five littoral states in Ashgabat, Turkmenistan on November 11-12, 1996, Russian Foreign Minister Yevgeny Primakov declared that Russia was ready to agree on the forty-five nautical miles of jurisdictional areas and to acknowledge the rights of the littoral states to exploit petroleum in areas they claimed to be their national sectors. A similar agreement was reached between Azerbaijan and Russia three years later during Russian President Vladimir Putin's visit to Baku on January 9-10, 2001, when the presidents of the two countries signed a declaration on the principles of cooperation in the Caspian Sea. 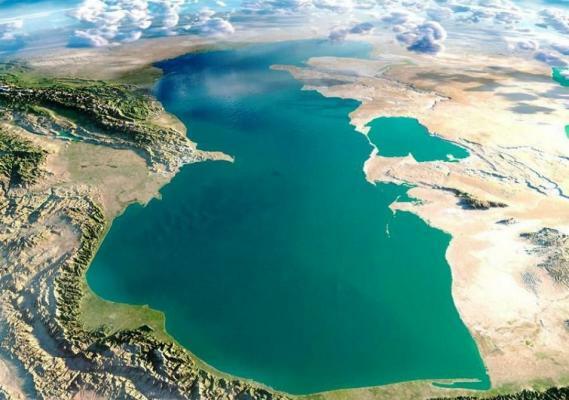 Iran believes that the 1921 and 1940 Soviet-Iranian treaties establish the legal regime for the Caspian Sea and in light of those treaties the mineral resources in the Caspian seabed and subsoil belong to all the coastal states. Iran supported joint ownership of the Caspian Sea and its utilization on a condominium basis. In an attempt to find a compromise with other littoral states, Iran has agreed to reconsider the condominium approach. Currently, it proposes to divide the Caspian Sea among the littoral states into five equal parts (20 percent for each littoral state), regardless of the length of the coastal line of the littoral state. Iran, like Russia, is concerned about the former Soviet republics activities to exploit mineral resources of the Caspian Sea with the Western oil companies. In this context, on February 5, 1998 the foreign ministers of Iran and Russia issued a joint statement opposing the possible construction of any trans-Caspian pipelines (that is, Kazakhstan-Azerbaijan, Turkmenistan-Azerbaijan). To justify their stand, both countries often raise concerns about the Caspian's sensitive ecological balance. Kazakhstan leans toward applying certain provisions of UNCLOS to the Caspian Sea, taking into account the Caspian Sea's specific features. 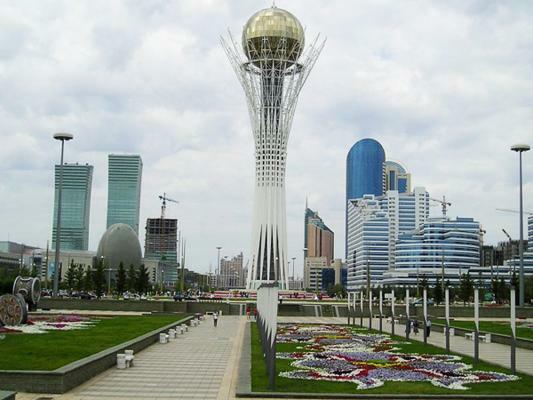 Kazakhstan has expressed the view that the Caspian Sea meets the definition of an enclosed or semi-enclosed sea as provided in article 122 of UNCLOS. Therefore, it proposes that the seabed and its resources be delimited among all Caspian states along a median line in accordance with the international maritime law. Turkmenistan's position has changed significantly during the last few years. Initially, Turkmenistan was inclined to divide the Caspian seabed as well as surface but insisted that both issues--seabed and surface division--be considered together. A joint statement made by the presidents of Kazakhstan and Turkmenistan on February 27, 1997, reads as follows: "Until Caspian states reach an agreement on the regime of the Caspian Sea, the parties will adhere to the delimitation of administrative and territorial borders along a line running through the middle of the Sea." The delimitation described in the statement was made in 1970, when the Soviet Union's Ministry of Petroleum and Gas Industry divided the Soviet part of the Caspian Sea into sectors belonging to the Azerbaijan Soviet Socialist Republic, the Kazakh Soviet Socialist Republic, the Russian Soviet Federative Socialist Republic and the Turkmen Soviet Socialist Republic along a median line. Following the collapse of the Soviet Union, the boarders inherited from such delimitation were reciprocally recognized as the State borders of the newly independent states. 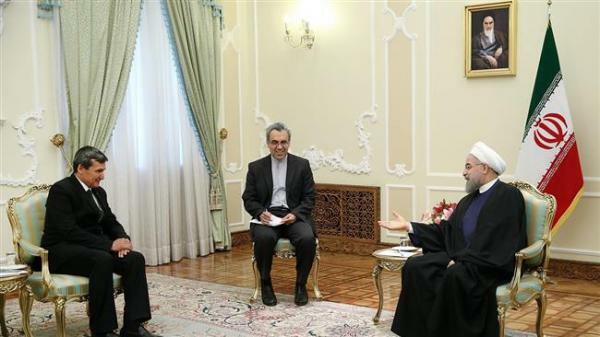 The joint statement also justifies the two states' opposition to the Iranian view. In particular, the statement points out that the Soviet-Iran treaties 1921 and 1940 divided the Caspian Sea between the Soviet Union and Iran along Astara-Gasan-Kuli line leaving outside determination of the borders among the former Union Republics bordering the Caspian Sea. The latter fell within the internal jurisdiction of the Soviet Union, in particular, exclusive jurisdiction of the central government, and, therefore, could not have been a subject of the 1921 and 1940 treaties. The joint statement further says that the treaties govern only questions relating to merchant shipping and fishing and do not establish the legal regime for the Caspian Sea. 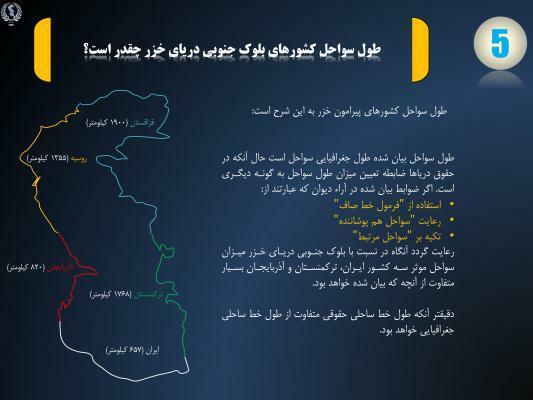 The statement, therefore, concludes that Iran's claims to the zones of the newly independent states are unjustifiable under the Soviet-Iranian treaties to which Iran usually refers in supporting its joint ownership/condominium approach and that the Soviet-Iranian treaties do not longer reflect the current state of affairs and cannot serve as a legal instrument binding on the littoral states. The two joint statements, made a year apart, differ significantly. Notably, at the time the Iran-Turkmenistan statement was issued, a dispute arose between Turkmenistan and Azerbaijan over demarcating national zones between the two countries and ownership to Kyapaz  oil deposit. 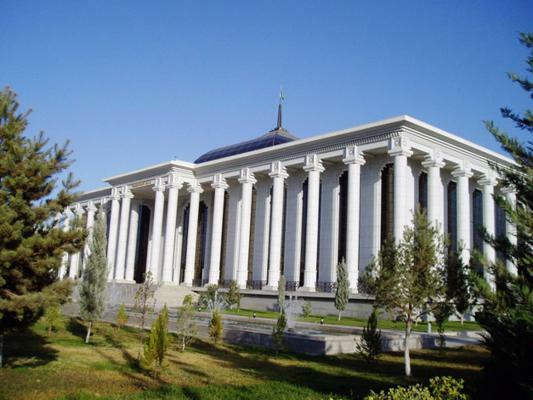 This dispute may have caused Turkmenistan to change its position. 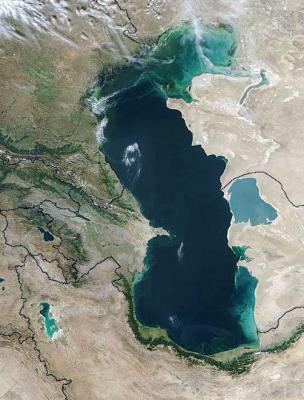 Azerbaijan believes that the Caspian Sea should be considered an international frontier lake without a link to the ocean, surrounded by the territory of five states. As such, it should be divided from a median line, according to the common international practice applicable to international frontier lakes, such as the Great Lakes, Lake Chad, Lake Geneva and some others. Moreover, common international practice shows that not only lakes, but also semi-closed and closed seas, e.g. the Black Sea and the Dead Sea, are delimited among littoral states according to the same principle, that is, from a median line. At the same time, Azerbaijan does not object to delimiting the Caspian Sea according to international maritime principles, in particular Article 15 of UNCLOS, which regulates delimitation of the territorial seas of states with opposite or adjacent coasts. Azerbaijan's flexibility is explained by the fact that it will still get the same area under its jurisdiction as it would if the Caspian Sea were divided according to the international practice applicable to the division of international frontier lakes. According to the general principles of Article 15, the sectors' borders of the littoral states would be drawn by a median line, every point of which is equidistant from the nearest points on the baselines from which the breadth of the territorial seas of each state would be measured. It should be noted that some legal experts cite specific provisions of Article 15 of UNCLOS referring to "historic title or other special circumstances" as factors to be applied to delimiting the territorial seas of states with opposite or adjacent coasts. If such provisions of Article 15 are applied to the Caspian Sea's delimitation, the division of the USSR's sector of the Caspian Sea among the Azerbaijan SSR, Kazakh SSR, Russian SFSR and Turkmen SSR in 1970 may meet the requirement of the "historic title or other special circumstances" of Article 15 of UNCLOS. Certainly, it is understandable that the position of littoral states with respect to the legal regime of the Caspian Sea mainly depends on what they will gain from such a regime. 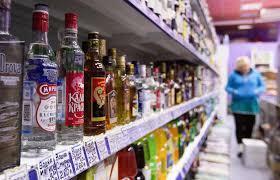 All of the littoral states will have to make concessions if a consensus is to be reached. A consensus may become the impetus for wider cooperation in the region, which should directly or indirectly benefit all parties concerned. In the meantime, it is up to the regional powers to move towards cooperation with the newly independent countries, which have on numerous occasions expressed a willingness to cooperate. Developments in the positions of the littoral states, particularly that of Russia, at the beginning of 2001 were promising and gave hope that a compromise in formulating a new legal regime for the Caspian Sea would soon be reached. 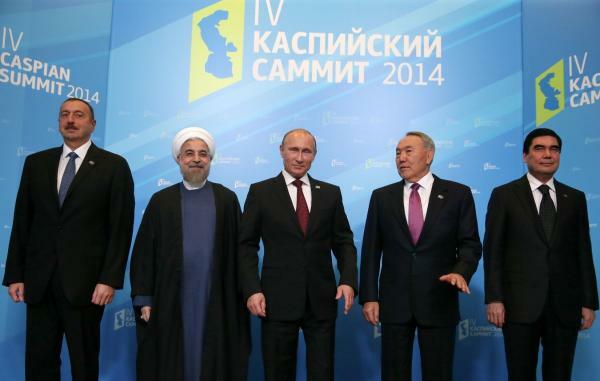 However, observers were less optimistic following the Russian-Iranian summit this past March. Thus a summit of littoral states, scheduled earlier for April 2001 in Turkmenistan, has been postponed until October 2001. 1. Fenyvesi, Charles. 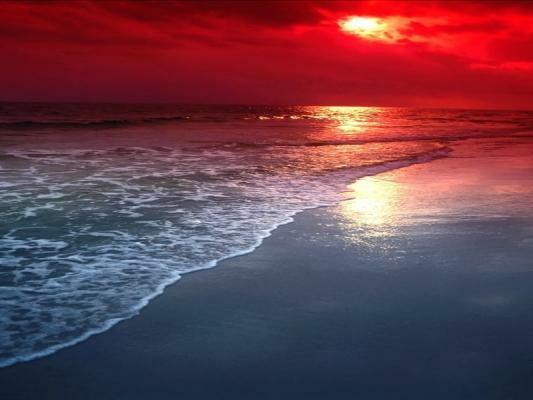 Caspian Sea: US Experts say oil reserves are huge. RFE/RL May 5, 1998. 2. Pugliaresi, Lucian. Energy Security: How Valuable is Caspian Oil? Harvard University Caspian Studies Program. January 2001. 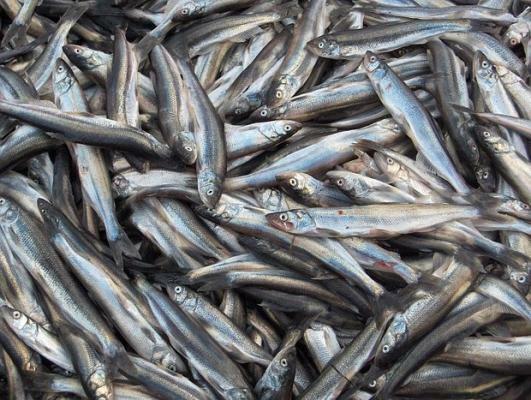 Apart from oil, the Caspian Sea is rich in gas deposits and fishery resources, including 90 percent of the world's sturgeon population and black caviar, all of which have a significant value in the world market. 3. The Treaty of Amity concluded between Iran and Russian Soviet Federative Republic on February 26, 1921 and the Commerce and Navigation Agreement concluded between Iran and USSR on March 25, 1940. 4. Sciolino, Elaine. It's a Sea! It's a Lake. No. It's a Pool of Oil. New York Times, June 21, 1998. 5. Shestopalov V. Persidskiy zaliv: problema kontinentalnogo shelfa. Moscow, Nauka, 1982. p.73. 6. Letter from Permanent Representative of Iraq to the United Nations addressed to the UN Secretary General (S/2001/374 dated April 16, 2001). 7 The Position of the Russian Federation regarding the legal regime of the Caspian Sea. (A/49/475 dated October 5, 1994). 8. The Agreement on the Delimitation of the Seabed of the Northern Part of the Caspian Sea for the Purposes of exercising Their Sovereign Rights to the Exploitation of its Subsoil sihned by the President of Russia and Kazakhstan on July 6, 1998. 9. Agreement on the Delimitation of the Seabed of the Northern Part of the Caspian Sea for the Purposes of exercising Their Sovereign Rights to the Exploitation of its Subsoil signed by the Presidents of Russia and Kazakhstan on July 6, 1998 (A/52/983 dated July 14, 1998). 10. Saivetz, Carol. Putin's Caspian Policy. Caspian Studies Program. October 2000. 11. The Position of the Islamic Republic of Iran concerning the legal regime of the Caspian Sea (A/52/324 dated September 8, 1997). 12. The Position of Kazakhstan on the legal status of the Caspian Sea (A/52/424 dated October 3, 1997). 13. 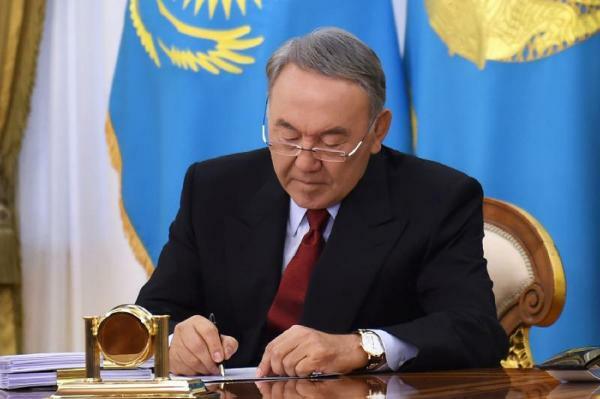 Joint statement on the questions related to the Caspian Sea signed by the President of Kazakhstan and Turkmenistan in Almaty on February 27, 1997 (A/52/93 dated March 17, 1997). 14. Joint statement of July 8, 1998 by the Presidents of Iran and Turkmenistan (A/53/453). 15. The dispute arose partly because of fluctuation of the Caspian Sea water level that affected the coastal and median lines of the Sea and, consequently, the delimitation of national sectors. 16. Statement regarding an agreement signed between Iran and the Western oil companies--Shell and Lasmo, on geological and geophysical prospecting in the area of the Caspian Sea which also includes an Azerbaijani part of the Caspian Sea. In 1995, Azerbaijan and Russia signed an agreement on exploitation of Kyapaz deposit. However, after a visit of Turkmenistan President Niyazov to Moscow, Russia denounced this agreement. 17. Statement by the Ministry of Foreign Affairs of the Republic of Azerbaijan adopted December 10, 1998 (A/53/741 dated December 14, 1998). 1. Brown E.D. The continental shelf and the exclusive economic zone: the problem of delimitation at UNCLOS III. Maritime policy and management. London, Vol. 4, No. 6 (1987). p. 377-408. 2. CIS/Iran: Caspian Talks. Oxford Analitica Brief. March 13, 2001. 4. Fenyvesi, Charles. Caspian Sea: US Experts say oil reserves are huge. RFE/RL May 5, 1998. 5. Handbook on the Delimitation of Maritime Boundaries. United Nations, New York, 2000. 6. Kapoor D.C. and Kerr A.J. A Guide to Maritime Boundary Delimitation. Toronto, 1986. 7. Kolchin S. Geostrategicheskiye aspecty energoresursov Kasliyskogo moray/ Mirovaya ekonomika I mezhdunarodniye otnosheniya. N3, March 1998. 8. Kurtov A. Kaspiyskoye more: neposledovatelnost Rossiyi nanosit usherb natsionalnym interesam. Obosrevatel, April 2000. 9. Logunov V. Mezhdunarodno-pravovoy rezhim Kaspiyskogo morskogo teatra. Voenno-morskoy mezhdunatodno-pravovoy spravochnik. Moscow, Voenizdat, 1966. 10. Mamedov, Rustam F. Mezhdunarodno-pravovoy status Kaspiyskogo moray kak pogranichnogo ozera. Beynalxalg Hugug. No. 1, 1998. 11. Momtaz, Djamchid. Le statut juridique de la mer caspienne. 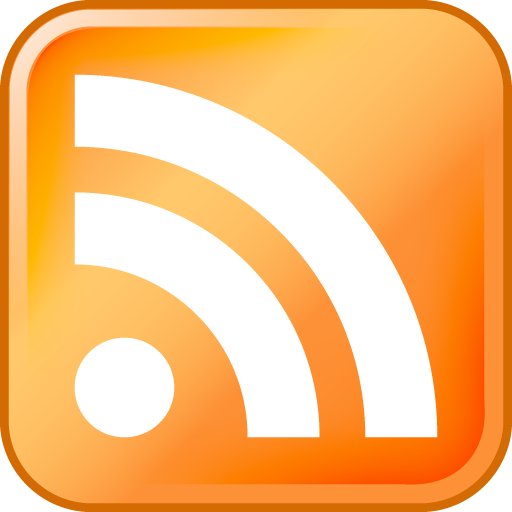 Collection espaces et resources maritimes. No. 5, 1991. 12. Oude Elferink, Alex. 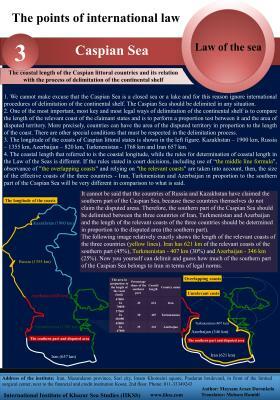 The law and politics of the maritime boundary delimitations of the Russian Federation. International journal of marine and coastal law. London, Part 1--11(4) November 1996; Part 2--2(1) March 1997. 13. Oxman, Bernard. 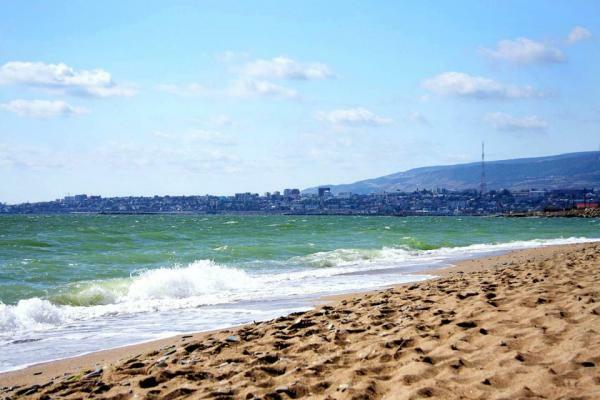 Caspian Sea or Lake: What Difference Does It Make? Caspian Crossroad Magazine. Vol. 1, Issue 4. Winter 1996. 14. Pettinger K. Delimitation of borders in the Caspian Sea: discussion of legal context. Sherman & Sterling. May 1995. 15. Pugliaresi, Lucian. Energy Security: How Valuable is Caspian Oil? Harvard University Caspian Studies Program. January 2001. 16. Rosemarie, Forsythe. The politics of oil in the Caucasus and Central Asia. Oxford University Press, 1996. 17. Russia: Caspian Great Game. Oxford Analytica Brief. May 22, 2000. 18. Saivetz, Carol. Putin's Caspian Policy. Caspian Studies Program. October 2000. 19. Sciolino, Elaine. It's a Sea! It's a Lake. No. It's a Pool of Oil. New York Times, June 21, 1998. 20. Shestopalov V. Persidskiy zaliv: problema kontinentalnogo shelfa. Moscow, Nauka, 1982. p.73. 21. Shu, Yang. The legal status of the Caspian Sea. Executive Intelligence Review. May 8, 1998. 22. Agreement on the Delimitation of the Seabed of the Northern Part of the Caspian Sea for the Purposes of exercising Their Sovereign Rights to the Exploitation of its Subsoil signed by the Presidents of Russia and Kazakhstan on 6 July 1998 (A/52/983 dated July 14, 1998). 23. Declaration expressing the position of the Islamic Republic of Iran on the exploitation of the resources of the Caspian Sea (A/52/588 dated November 25, 1997). 24. Joint statement of 8 July 1998 by the Presidents of Iran and Turkmenistan (A/53/453). 25. 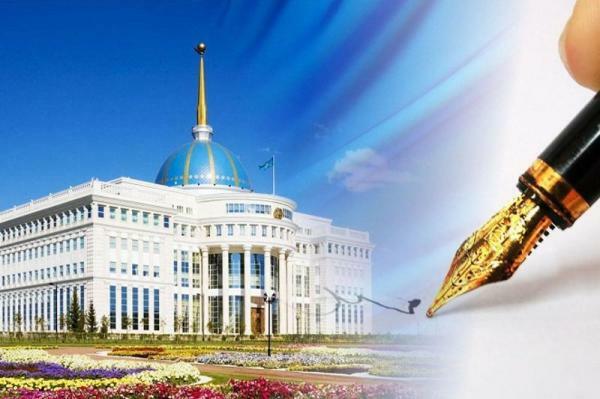 Joint statement on the questions related to the Caspian Sea signed by the President of Kazakhstan and Turkmenistan in Almaty on February 27, 1997 (A/52/93 dated March 17, 1997). 26. Statement by the Ministry of Foreign Affairs of the Republic of Azerbaijan adopted December 10, 1998 (A/53/741 dated December 14, 1998). 27. 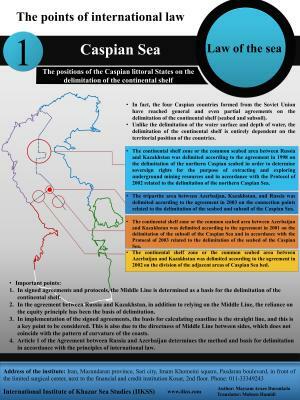 The Position of the Russian Federation regarding the legal regime of the Caspian Sea. (A/49/475 dated October 5, 1994). 28. The Position of the Islamic Republic of Iran concerning the legal regime of the Caspian Sea (A/52/324 dated September 8, 1997). 29. The Position of Kazakhstan on the legal status of the Caspian Sea (A/52/424 dated October 3, 1997). 30. Letter from Permanent Representative of Iraq to the United Nations addressed to the UN Secretary General (S/2001/374 dated April 16, 2001).